Despite the Exclusion Act, the Chinese community began to emerge as a community with an increase in the number of families, though the majority of the residents remained single men. Community organizations including the Boys Scouts, the Quong Kow Chinese School and family associations emerged to solidify the community. The number of laundries peaked while restaurants and nightclubs became important economic drivers. Because Chinatown was isolated from mainstream society, the control of commercial life and illegal activities were fought over by competing organizations. After periodic bursts of violence, a truce was reached in the mid-‘30’s. Retail District expands down Washington St.
New movie theaters and vaudeville. 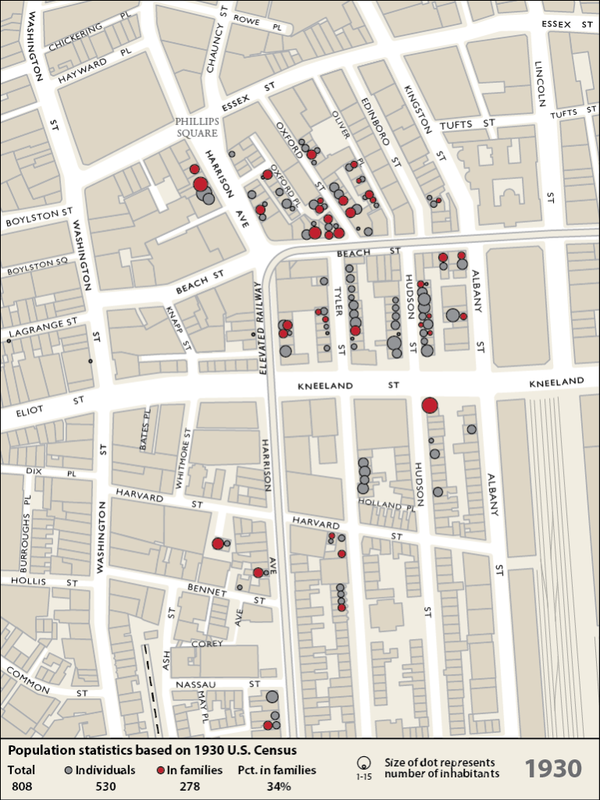 Garment industry south of Kneeland St.
New restaurants on Harrison Ave. and Tyler St.
Widening of north side of Kneeland St.
More Chinese families arrive despite severe restrictions. As New England’s industries fade, laundries decline. Restaurants flourish in the ‘20’s both for cheap food and bohemian cachet. Diminish with the Depression and the end of Prohibition. 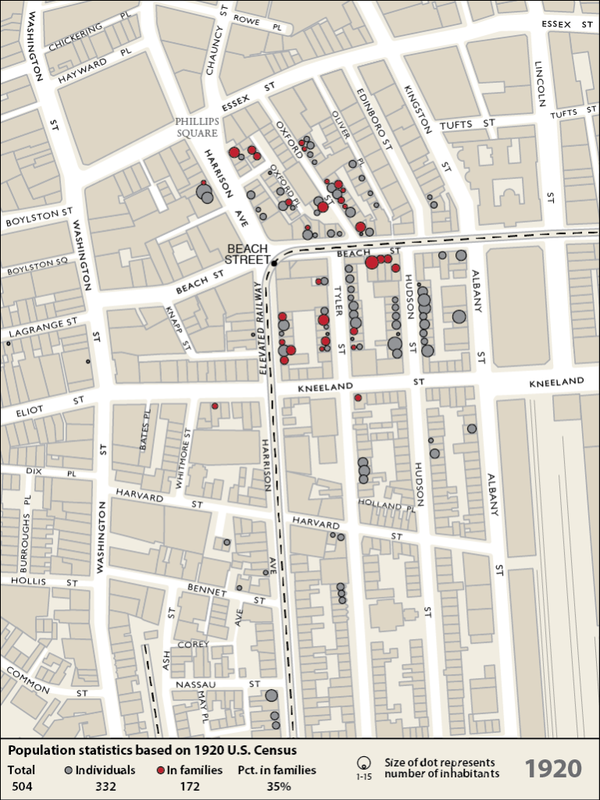 The sequence of maps from 1900 to 1940 shows the expansion of Chinatown and the increase of families (red dots) in that period. Beehive Maps. Despite the severe restrictions of the Chinese Exclusion Act, Chinatown began to emerge as a community as the number of families increased. The Exclusion Act was passed in 1882 with the intention of ridding the U.S. entirely of the Chinese by attrition. As a result, the Chinese population in the U.S. dropped steadily from about 105,000 in 1880 to 61,000 in 1920. However, the Chinese population in Massachusetts increased from about 300 in 1880 to its peak of around 3000 in 1900 as the Chinese were driven out of the western states. It then remained at that number until after World War II. But the composition of the population changed during that period from mainly single men to a few families. In order for this to happen, various methods were devised to circumvent the unjust laws “harsh as tigers”. Besides smuggling, almost all involved the claim of birth in the United States pursued through legal challenges or bribery of immigration officials. In the Northeast, these took place at border crossings from Canada through Vermont and upper New York State until the early 1900s. But the big break-through came with the San Francisco earthquake of 1906 that destroyed the region’s birth records. Chinese residents were able to assert that they were born in the U.S. and so gained citizenship. Many brought their own children (mostly boys again) over when they reached working age. The registration papers of the fictitious children were given to relatives or sold to others. The papers were then used to enter the U.S. – thus the term “paper son”. Immigration officials were aware of this and subjected all entering Chinese to interrogations covering in detail the parents, siblings, relatives, the house, the village, etc. Because even one slipup would result in deportation there were elaborate study notes that had to be studied and memorized. According to Professor Judy Yung of UC Santa Cruz, of the 175,000 Chinese that came to America between 1910 and 1940, 80% to 90% were paper sons. 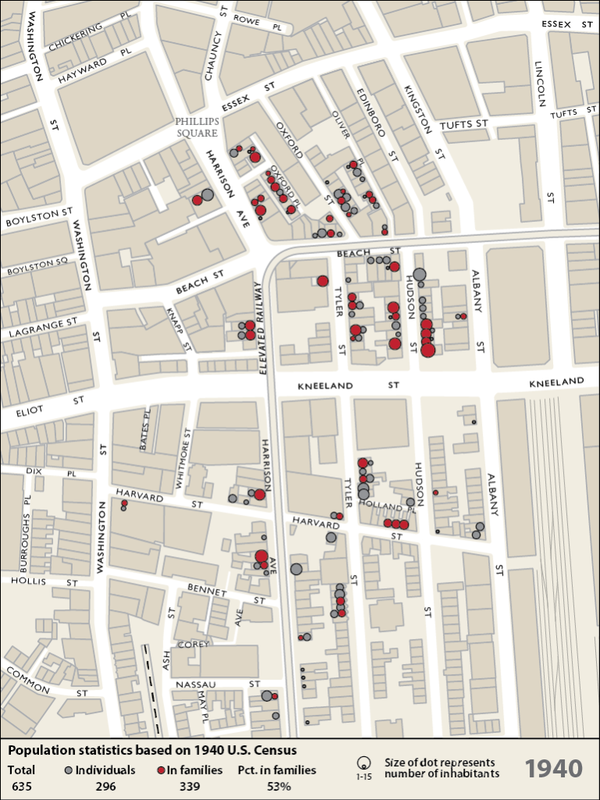 In Boston, this resulted in the slow but steady increase of families in Chinatown. While the total population was flat, the number of families grew from 20 in 1900 to 27 in 1910, 43 in 1920, 64 in 1930 and 83 in 1940. The percentage of people in households increased from 20% in 1900 to 53% in 1940. This was also the case of those in laundries and restaurants in outlying towns and cities. With the rise of families, the community began to organize activities to serve the increasing number of children. The families took advantage of the opportunities in Boston to break free of traditional limitations– sending boys and girls alike to the public schools. The Quong Kow Language School was founded in 1916 to teach Chinese language and literature. (The language of instruction was in the dialect of Taishan County in Guangdong Province, the origin of most of the immigrants). The entire community supported the school and the On Leong Merchants Association provided space for the growing school in a converted garment factory on Oxford Street. 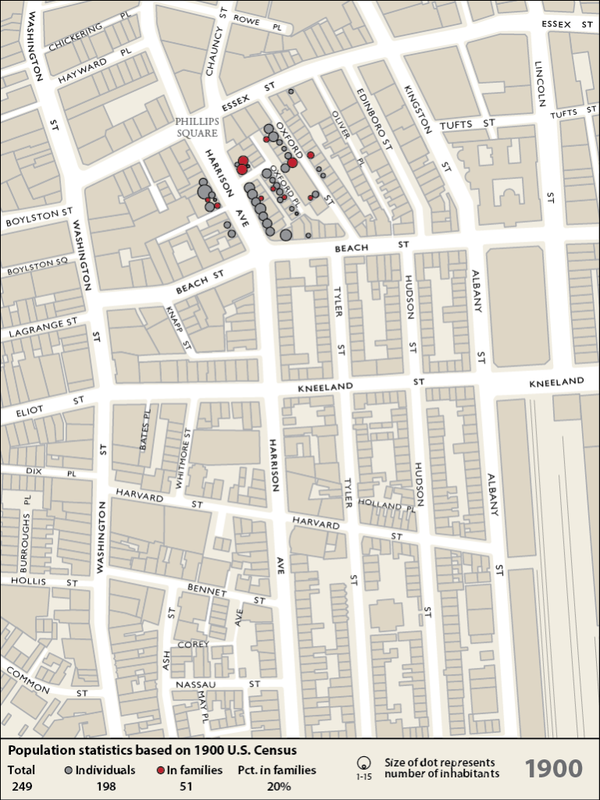 By 1931, the school was serving over a hundred students from both Chinatown and outlying areas. 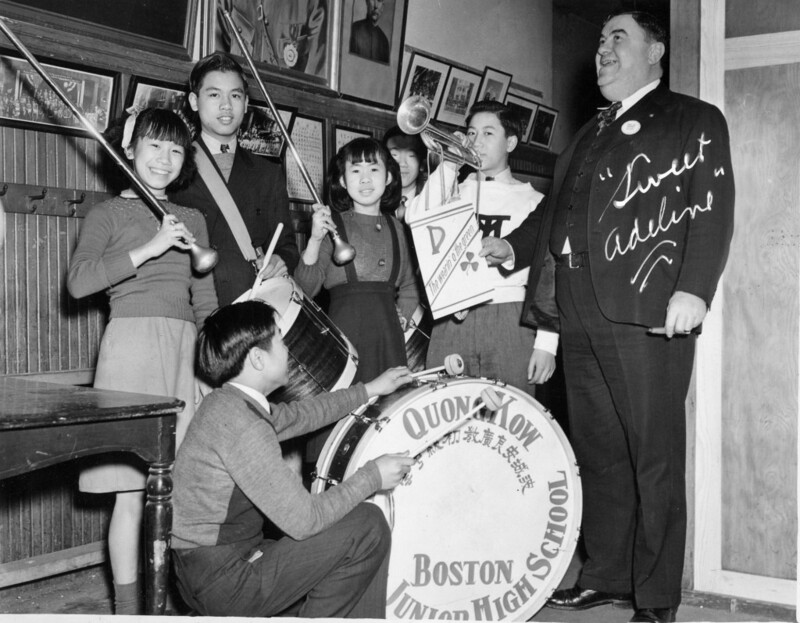 The school sponsored a marching band that participated in parades on holidays, opening Chinatown to the larger community. 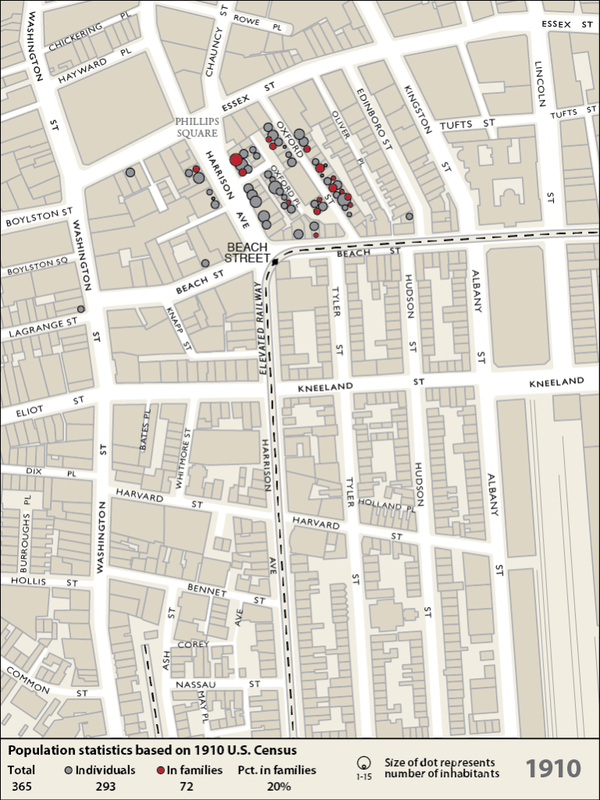 The Chinese Mission on Oxford St. added Sunday schools for children and the Chinese branch of the Young Men’s Christian Association expanded to provide recreational and athletic facilities on Tyler Street. Ralph Chin and sister, Russell Wong, Tunney Lee on Oxford St – 1940s. Russell Wong photo. Civic groups outside of Chinatown collaborated with community groups to offer services. A Boy Scout troop was formed in 1912 and served as stepping-stone for many future leaders of the community. The Denison House was founded to provide services for the immigrants in the South Cove – first for the Syrians and then for the Chinese. Many activities were sponsored including a girl’s basketball team. One of the volunteers at the Denison House was Amelia Earhart who would bring her roadster that she named the Yellow Peril – for its color and perhaps irony. Girls basketball team Denison House 1931. Radcliffe Institute photo. Amelia Earhart late 20s outside Denison House on Tyler St. 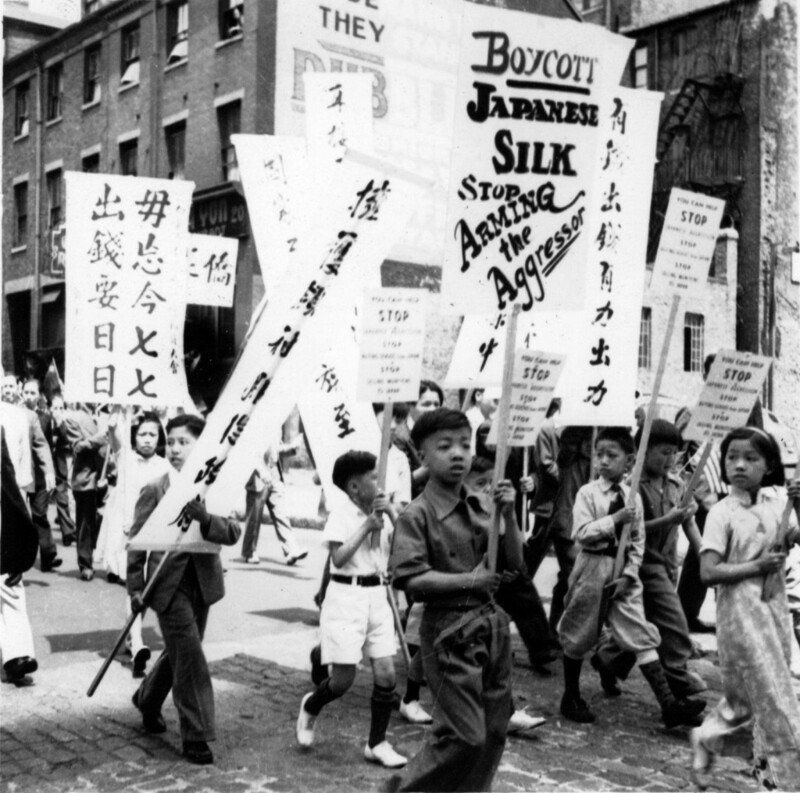 In 1937, Japanese invaded Manchuria and 1938 occupied Guangzhou and the Pearl River Delta region – the ancestral homeland of the Chinese immigrants in Boston’s Chinatown. The community was galvanized by the invasion and organized to protest and raise awareness to the City. The very groups that had been formed for education and advancement now participated in fund-raising, boycotts and parades. At the urging of Madame Chiang Kai-shek, the women organized the New England chapter of the New Life Movement. In 1941, Japanese attacked Pearl Harbor. America formally entered World War II. Immigration stopped and communication was cut off for the duration of the war. By the end of World War I as New England industries began to decline, laundries peaked as the main driver of Chinatown’s economy. Chinese restaurants, which had first appeared to serve the needs of the Chinese themselves, became popular among non-Chinese. 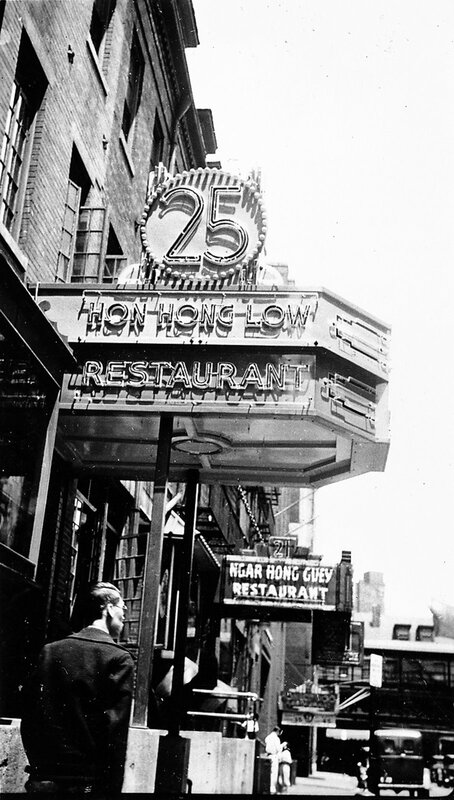 The number of restaurants in Boston’s Chinatown grew to serve not only Bostonians, but suburbanites. 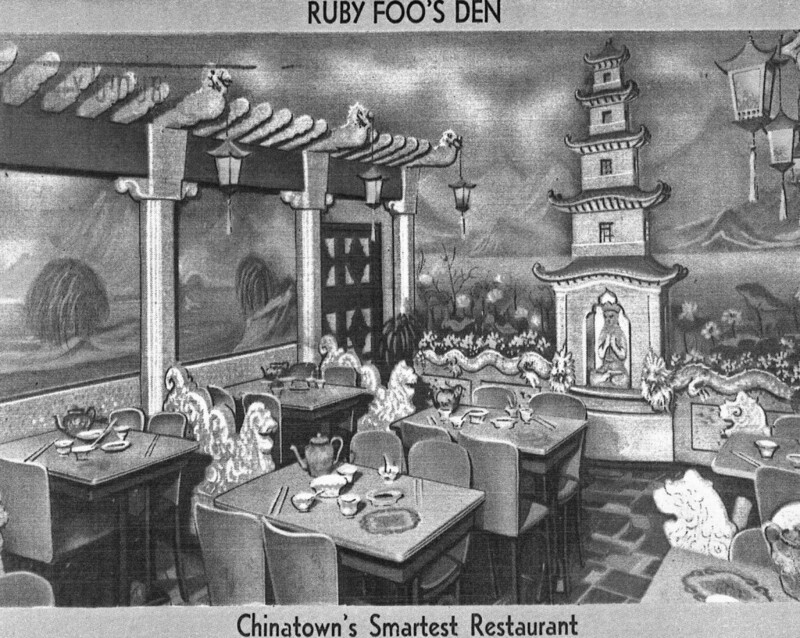 The restaurants expanded down Tyler and Hudson Streets avoiding the blight and noise of the El on Beach St.
Chinese entrepreurs took advantage of the vibrant spirit of the “Roaring Twenties” with the establishment of nightclubs in Chinatown, the Theater District and along Huntington Avenue. Unfortunately, the nightclubs closed as business disappeared with the Great Depression and the end of Prohibition. With the growth of the restaurants and nightclubs, came the expansion of grocery stores, food preparation establishments such as noodle factories and bean sprout “factories”, which serviced their needs. These enterprises became an integral part of the laundry/restaurant/support services Chinatown community. Like many other ethnic groups that were outside the mainstream, organizations (the Mafia, Jewish mob, etc.) were founded to conduct the illegal activities that targeted the immigrants. In Chinatowns across the country, these focused on the needs of the single men – gambling, opium and prostitution. The Hip Sing Tong and the On Leong Tong were the two major organizations that emerged nation-wide to gain control of these lucrative businesses. Boston was one of the cities caught up in the struggle with violence erupting from time to time. Local police were content (and bribed) to look the other way as long as the activities stayed within Chinatown. But when killings made headlines, there were crackdowns and efforts to negotiate a truce between the On Leong and Hip Sing. After years of conflict, negotiations and pressure from national and local law enforcement, the two groups reached an agreement to split the territories – On Leong on the East Coast including Chicago and Hip Sing on the West Coast. The violence subsided thereafter. Also like other ethnic groups, the On Leong Merchants Association while controlling illegal activities were also sponsoring community organizations – like the Quong Kow Chinese School and the marching band; hosting touring Chinese opera troupes; etc. It also served as the liaison between Chinatown and its chairman was dubbed the “Mayor of Chinatown” by the press. By the late 1930s, overt violence had subsided but gambling continued quietly with the connivance of the police. Opium smoking was substantially reduced through the heavy crack-down by the federal government on both the international trade, dealers and users.